Are you looking for that special Father’s Day gift for your dad? Then consider getting him a Frank Sinatra souvenir sheet newly issued by Magyar Posta! 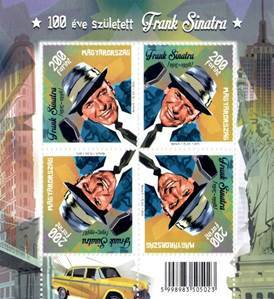 Look no further than our online store for Hungary’s 2015 Frank Sinatra Souvenir Sheet. You can check out this special offering which we hope you and your Dad as well as the rest of the family will enjoy! Magyar Posta is issuing a special stamp to commemorate the centenary of the birth of the American actor and singer Frank Sinatra, who won eight Grammy awards, three Oscars and several Golden Globe awards. The stamp design features the famous performing artist’s portrait. Fifty thousand copies of the miniature sheet containing four identical stamps designed by graphic artist Ágnes Berta were produced by the Pénzjegynyomda printing company.